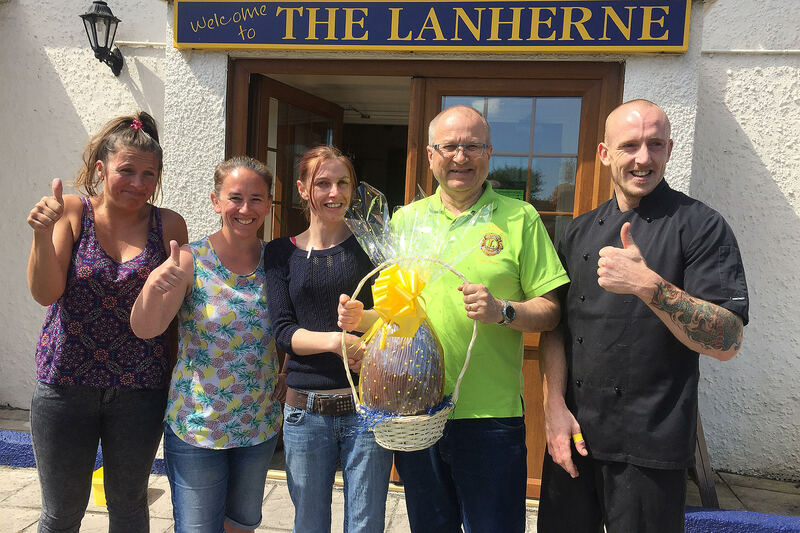 Staff at Newquay’s Lanherne Pub and Restaurant had a pleasant surprise after they had helped out Newquay Towan Blystra Lions Club with their annual Giant Easter Egg Raffle. Along with seven other pubs in the town, the Lanherne had sold tickets to win the egg and when the draw was made on Good Friday, it was Lanherne landlady Anne LaCayo who won the chocolate treat. As a thank you to her staff for all the work they put in she donated it to them to share. Pictured (left) are the Lanhern’s Tamsin, Natalie, Chrissie and James with Lion President Danny Baize. In total, the proceeds from the raffles across Newquay raised almost £900 and the pubs chose the following charities to benefit from half of the proceeds with the other half being used by the Lions to support local good causes. The Sailors Arms and the Walkabout nominated Children’s Hospice South West to receive their share of the proceeds and Cornwall Air Ambulance was the choice of The Quintrell Inn and The Kings Head at Lane. Others to benefit were CLIC Sargent (Wetherspoons Towan Blystra), British Heart Foundation (Lanherne), RNLI (Griffin) and Bowel Cancer West (Treninnick Tavern).